The King of the Kosher Grocers by Joe Minjares, local playwright, entertainer, and restaurateur will be performed again at the Sabes JCC Theater by The Park Theater Company: St. Louis Park’s Community Theater. Veteran actor, Marshall Hambro, reprises his role of Izzie Silvers, owner of Silver’s Grocery in North Minneapolis. After over 50 years, both the store and owner are showing their age. This warm-hearted comedy evokes a neighborhood with a rich and diverse history facing the challenges of urban renewal, a tight-knit circle of old friends, and the survival of a small business with an aging proprietor and loyal customer base. A talented supporting cast of characters help captivate the audience in telling this story of friendship, Minneapolis’ mosaic of ethnic diversity, and life’s challenges as well as wonderful surprises. Thank You for another amazing run of The King of the Kosher Grocers. 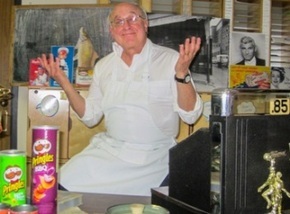 The King of the Kosher Grocers by Joe Minjares was presented with 14 performances at the Sabes JCC Theater by The Park Theater Company: St. Louis Park’s Community Theater in May and October 2013.